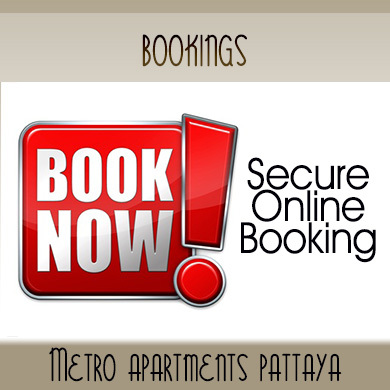 FAQ's | Metro Apartments Pattaya | All your questions answered. We have listed most of the frequently asked questions by our very happy hotel guests, let us know if we can help you further by contacting us via the contact form on this website or by calling our hotel, and we’ll be very happy to answer any questions you may have. Q. How late can I check in? A. You can check in at any time. Although we close around 2 or 3 A.M. if we know you are coming, we will be there. Q. What is required on check in? A. Staff are required to copy the information page of your passport and details of your visa so they can register you with the Immigration office. A damage deposit of Baht 1,000 is also required. Q. When is check out time? A. It is usually possible to have the room up to noon or 1 P.M.
Q. Is a late check out possible? A. Yes, it is sometimes possible that the next guest is arriving later in the day and where this is the case, you can hold the room without charge until 4 P.M. If you require the room later than this time, it may be best to book the extra day. We are flexible with this whenever we can be. A. Your deposit is returned by the staff whenever your room and minibar have been checked by our staff and your bill is being settled. Q. Can I bring a guest back to my room? A. Yes, this is possible. However, you are responsible for the behaviour of your guest whilst on the premises and for any damage done. Q. Is there a 'joiner fee'? A. No. There is no joiner fee. A. Visit Our Bookings Page and book with our Secure Online Booking. Or call us to check for availability, alternatively you can book and pay by Paypal, please contact Dennis for all paypal payments and bookings. Q. When can I expect a reply to my inquiry? A. Generally, we check for emails two or three times per day. So, whether you are in Australia, Europe or the US, you should receive a reply within 24 hours. If you do not, please email us again in case your original inquiry got lost in cyberspace. Q. Why do you require a deposit? A. In order to minimize the number of 'no shows' we require a deposit to secure the booking. By doing this we maximize room occupancy and this helps keep our rates as low as possible. This requirement can be dropped whenever we have built up a reliable relationship with you. Q. Do you take credit / debit cards? A. Yes, you can pay in-house with most Credit Cards e.g. Visa, Mastercard but not American Express. Q. What happens if I have paid a deposit and subsequently need to cancel my booking? A. We know that even the best laid plans can come undone through outside influences. Please check the booking conditions on the booking engine website or email us directly with your questions. Q. What is included in the room rates? A. The rate includes 2 x fresh towels daily; daily cleaning by the maid; fresh bed linen every second day; in-room WIFI access, an in-room DVD player, DVD and book library, Sophon cable TV, air-conditioning and in the case of superior rooms 1.0l water, tea and coffee making facilities. Q. Can I have the bed linen changed every day? A. Yes, this is possible at an additional cost. Q. What TV is there available in the room? A. All rooms have Sophon cable. Satellite TV with more channels is too costly to provide. On Sophon Cable there are some channels which tend to satisfy most guests' needs. Some of them are: BBC, CNN, DW, BVN, Australia Network, Pattaya People TV, a couple of movie channels from Sophon, Thai TV Channels, RTV, Rai Italia, a couple of music channels and numerous other Asian channels. Q. What TV is available in the bar? In the bar we have Sophon Cable and Truevisions from Thailand as well as other Sports/News feeds from abroad. 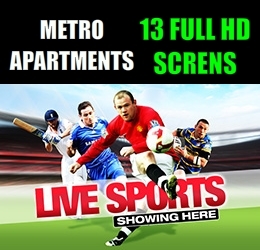 We have several tuners and can offer up to 12 different TV feeds at one time. Practically, this means we show the leading sports game on one or two screens with soundtrack and on several other screens we show other matches without the soundtrack. At various times of the year, Rugby takes priority over English Premier League matches. A. Although Pattaya is a 'party-town' surrounded by a couple of dozen golf courses; there are quite a lot of places to see. Reception staff will willingly help you and suggest travel operators to visit. If you wish to play some golf we can also help when it comes to getting into a 4-ball.